On July 4th 1976, America celebrated its bicentennial. In that same summer, a small company known for selling fun motorcycles introduced a car that will later dominate the mid-size sedan segment. Take a break from your cookouts and say happy 4oth birthday to the Honda Accord. The Accord began a small hatchback with starting price of $3,995. It debuted right after the OPEC oil crisis pushed up fuel prices and American automotive tastes started to shift towards smaller and more fuel efficient vehicles. 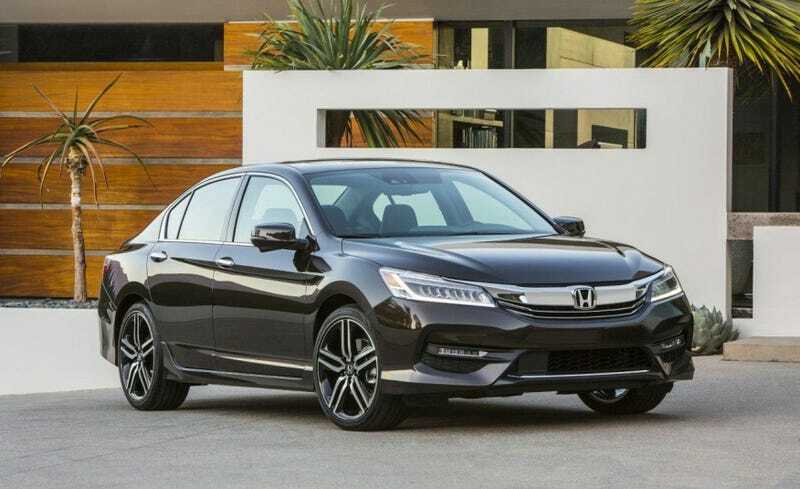 The 2016 model has come along way from the ‘76 Accord. The original and an 89 horsepower motor and car came with “luxuries” like air-conditioning and roll down windows. Today, the starting price is $22,355 for a 6-speed manual LX model that comes standard with basically everything to make your commute bearable such as a rear-camera, bluetooth, dual zone climate control. You can also get a V6 motor with 276 hp or a Hybrid that will get up to 48 MPG combined. A fully loaded Accord Hybrid Touring maxes out at $37,790. In the past 40 years 12.7 million people chose the Accord to a reliable car that in some iterations was actually somewhat fun to drive. In the 90's my mom bought two Accords back to back, both with a 5-speed manual. They were a refreshing change from her Jetta GLI whose “German build quality” no longer translated into reliability. The 5th generation Accord was available in sedan, coupe, and wagon. Image: Honda. Show us your favorite Honda Accord and if you have any fun stories that involve one of America’s most popular sedans share them in the comments below.